Cover Teaser: The REST of OKC! Welcome to Oklahoma Gazettes annual Rest of OKC issue, where we take a lighthearted look at the best other things in Oklahoma City! Youll find a list of all of this years Best of OKC winners plus fun and games celebrating the weird and wonderful things about our great city. Plus! Word libs! Adult coloring pages! Word finds! Connect-the-dots games! AND MORE! By Gazette staff. Cover design Christopher Street. To read the full story, pick up your copy at any of our 800 metro locations on Wednesday! 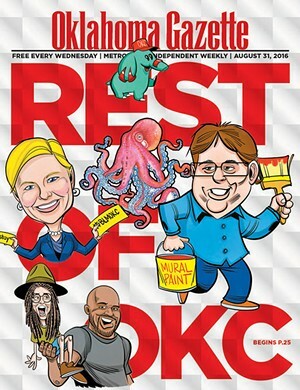 Cover Teaser: Best of OKC 2016 results! Welcome to Oklahoma Gazette’s annual Rest of OKC issue, where we take a lighthearted look at the best other things in Oklahoma City!